Containers are an integral part of the S.P.A.C.E organizing process. I use the term container loosely here. A container can be anything with sides (round, triangular, square, whatever), with or without a lid, or it can be something less conventional such as a wicker basket, a hanging rack or a bookcase. What’s so important about containers? Well, there are a number of benefits. They help to provide a specific home for your belongings. Where do you keep your everyday silverware? The majority of people have a specific drawer and a slotted container to contain their everyday knives, forks, and spoons. This gives them a home and makes them super easy to find when you need them. Wouldn’t it be great if everything was that easy to find? Well, if you use well designed containers for all your storage, you can easily find just about anything at a moment’s notice. They provide boundaries for your belongings to keep things looking neat and tidy. Have you ever seen a tidy desk with a place for everything and everything in it’s place? You know the type I mean – a pen/pencil holder, and papers neatly contained in a bin or tray. It looks so much better than random items scattered all over the desk. This trick can work anywhere in your home – A basket to corral the magazines in your living room or all your winter hats, scarves, and mitts, a hanging rack in the bathroom or kitchen to hold commonly used items, or a bookshelf for your books and knickknacks. They provide a measure for when your belongings have outgrown the space provided. Sort and Purge: Edit your belongings to pare them down. For some reason, you’ve accumulated more of an item than you actually need, so it’s time to let go of some of the items. Note that this accumulation process usually slows down when you have organized items to a home and container, as you generally know what you have and don’t tend to accumulate as much. Assign a new home and/or container: If you actually do need or want your entire collection of items, it’s time to re-think your storage solution and adapt it to your new needs. Maybe you’ve started a new hobby and you are really enjoying it and have the luxury of being able to spend more time on it. Or perhaps you have an addition to the household (baby, roommate, pet), and you need room to accommodate items for them. Depending on how much space you have in your house, you may need to compromise by moving or removing other less used items. 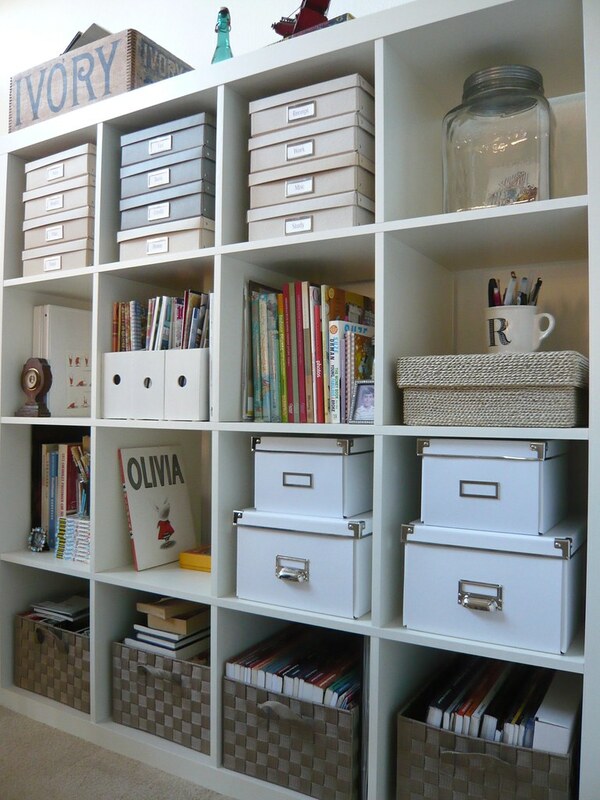 They provide an unlimited means for being creative with your organizing style. This is where you get to be creative and have fun with organizing. Ideas for containing your belongings are as unlimited as your imagination (and time spent on Pinterest 😊). Always sort and purge first – then you will know how much space you need to contain your belongings. If you buy containers first, you may find they don’t really suite your actual needs. If you’re on a budget, use containers you already have around the house. Anything from Rubbermaid bins to empty shoe boxes and cereal boxes can be used as a container. Dollar stores are also a great source for budget storage solutions. If you’re looking for an aesthetically pleasing solution, use similar containers of different sizes for a cohesive look. Limit the number of styles you use. If you’re a ‘visual’ person, and concerned about not being able to see things, opt for clear storage options or options without lids. This way, you can still see what’s in the container. Think outside the box – Storage solutions don’t have to have square edges. They can be any shape you want. Round storage containers may not hold as much as square or rectangular storage, but they can be aesthetically pleasing. For smaller items, you can use decorative bowls or trays, or stylish baskets. Ice cube trays and small tackle boxes are great storage solutions for small items in a drawer. Go vertical – hanging storage solutions can use otherwise neglected storage space. Hang your meal prep knives on a magnetic strip or create hanging storage inside your tub space for shower essentials. If you’re into crafts, DIY a forgotten treasure into something cool and creative. Check out Pinterest for tons of DIY ideas.